TONIGHT’S GAME: The Stampede face the Lincoln Stars for the fifth and final time this season. Sioux Falls holds a 3-1-0 mark against Lincoln, including a 5-2 victory in Sioux Falls back on February 1st. STAMPEDE UPDATE: The Stampede are coming off a big 5-0 victory over Cedar Rapids last Saturday at the PREMIER Center. Blake Bride led the way with two goals, including one shorthanded, and one assist while Ryan Sullivan, Austen Swankler and Andre Lee all tallied goals in the victory. Alec Calvaruso earned his first career USHL shutout by stopping all eight shots faced. The eight shots against were the fewest in Stampede team history. The Herd enter tonight trailing Waterloo by two points for second place in the Western Conference with 77 points and five games remaining on the schedule. The first tie breaker for playoffs is regulation and overtime wins which Waterloo leads 35 to 32 over the Stampede. The second tiebreaker is head-to-head which the Stampede would win. The top two teams from each conference receive first round byes while the third and fourth place seeds will host a best-of-three first round series against the fifth ands sixth place seeds. The playoffs begin the week of April 15th. STARS UPDATE: The Stars have struggled this season and are preparing for next year. They enter tonight on a seven-game winless streak and are just 1-16-2 in their last 19 games. In their last four contests, the Stars have only been outscored 1-0 in the first period. That disadvantage jumps to 8-0 in the second frame, and to 12-5 in the third. Brock Bremer leads the team in scoring with 32 points in 54 games. Josh Lopina is second on the team with 25 points. In goal, Jacob Mucitelli has faced the Herd twice this year, going 1-0-1 with a 2.48 GAA while Samuel Hlavaj is 0-1-0 with a 5.00 GAA. Both goaltenders have been splitting time in between the pipes for the Stars. UP NEXT: The Stampede hit the road for a long road trip to Youngstown this Friday and Saturday night against the Phantoms. It is the only meeting of the year between the two teams. 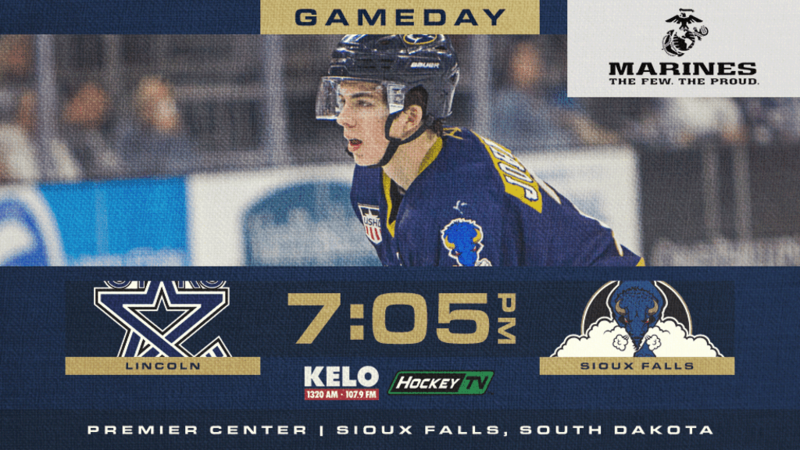 Puck drops are 6:05 PM each night and fans can catch both games on KELO News Talk 1320-AM, 105.1-FM, 107.9-FM and KELO.com. The Herd return home next weekend for the final regular season homestand of the season. Friday, April 12th is Fan Appreciation Night, presented by Signature Companies and Saturday, April 13th is Take My Jersey Night, presented by Waterbury Heating & Cooling and Coleman Heating & Air Conditioning. Tickets are on sale now through the KELOLAND Box Office or any Ticketmaster outlet.